The following report from The Times of April 28, 1937, which was also to appear in The New York Times, and in translation in the French magazine L’Humanité, electrified world public opinion and helped make the bombing of Guernica an international incident. It was written by George Steer, whose familiarity with Basque traditions, passionate support of the Republican cause in the Spanish Civil War, and outrage over the bombing may have led him to exaggerate some details, and to emphasize that Guernica was far behind the battle lines and not a military objective. The bombing by the German airforce in support of Franco’s Nationalists was the first time the devastating potential of air warfare had been demonstrated. 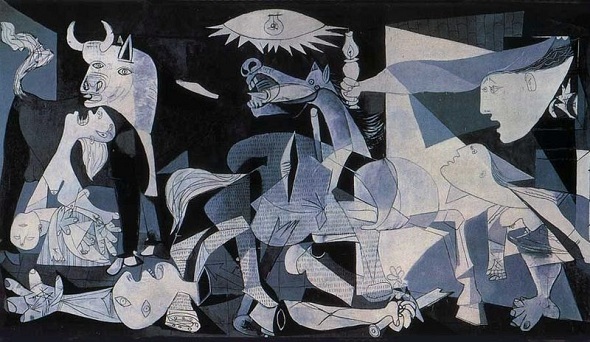 Can we ever imagine the atrocities of Guernica? To what extent do we actually relate the incident with the painting? Read on. Guernica, the most ancient town of the Basques and the centre of their cultural tradition, was completely destroyed yesterday afternoon by insurgent air raiders. The bombardment of this open town far behind the lines occupied precisely three hours and a quarter, during which a powerful fleet of aeroplanes consisting of three German types, Junkers and Heinkel bombers and Heinkel fighters, did not cease unloading on the town bombs weighing from 1,000lb. downwards and, it is calculated, more than 3,000 two-pounder aluminium incendiary projectiles. The fighters, meanwhile, plunged low from above the centre of the town to machine-gun those of the civilian population who had taken refuge in the fields. The whole of Guernica was soon in flames except the historic Casa de Juntas with its rich archives of the Basque race, where the ancient Basque Parliament used to sit. The famous oak of Guernica, the dried old stump of 600 years and the young new shoots of this century, was also untouched. Here the kings of Spain used to take the oath to respect the democratic rights (fueros) of Vizcaya and in return received a promise of allegiance as suzerains with the democratic title of Señor, not Rey Vizcaya. The noble parish church of Santa Maria was also undamaged except for the beautiful chapter house, which was struck by an incendiary bomb. At 2 a.m. to-day when I visited the town the whole of it was a horrible sight, flaming from end to end. The reflection of the flames could be seen in the clouds of smoke above the mountains from 10 miles away. Throughout the night houses were falling until the streets became long heaps of red impenetrable débris. Many of the civilian survivors took the long trek from Guernica to Bilbao in antique solid-wheeled Basque farmcarts drawn by oxen. Carts piled high with such household possessions as could be saved from the conflagration clogged the roads all night. Other survivors were evacuated in Government lorries, but many were forced to remain round the burning town lying on mattresses or looking for lost relatives and children, while units of the fire brigades and the Basque motorized police under the personal direction of the Minister of the Interior, Señor Monzon, and his wife continued rescue work till dawn. It is impossible to state yet the number of victims. In the Bilbao Press this morning they were reported as “fortunately small,” but it is feared that this was an understatement in order not to alarm the large refugee population of Bilbao. In the hospital of Josfinas, which was one of the first places bombed, all the 42 wounded militiamen it sheltered were killed outright. In a street leading downhill from the Casa de Juntas I saw a place where 50 people, nearly all women and children, are said to have been trapped in an air raid refuge under a mass of burning wreckage. Many were killed in the fields, and altogether the deaths may run into hundreds. An elderly priest named Aronategui was killed by a bomb while rescuing children from a burning house. The tactics of the bombers, which may be of interest to students of the new military science, were as follows:—First, small parties of aeroplanes threw heavy bombs and hand grenades all over the town, choosing area after area in orderly fashion. Next came fighting machines which swooped low to machine-gun those who ran in panic from dugouts, some of which had already been penetrated by 1,000lb. bombs, which make a hole 25ft. deep. Many of these people were killed as they ran. A large herd of sheep being brought in to the market was also wiped out. The object of this move was apparently to drive the population underground again, for next as many as 12 bombers appeared at a time dropping heavy and incendiary bombs upon the ruins. The rhythm of this bombing of an open town was, therefore, a logical one: first, hand grenades and heavy bombs to stampede the population, then machine-gunning to drive them below, next heavy and incendiary bombs to wreck the houses and burn them on top of their victims. The only counter-measures the Basques could employ, for they do not possess sufficient aeroplanes to face the insurgent fleet, were those provided by the heroism of the Basque clergy. These blessed and prayed for the kneeling crowds—Socialists, Anarchists, and Communists, as well as the declared faithful in the crumbling dugouts. When I entered Guernica after midnight houses were crashing on either side, and it was utterly impossible even for firemen to enter the centre of the town. The hospitals of Josefinas and Convento de Santa Clara were glowing heaps of embers, all the churches except that of Santa Maria were destroyed, and the few houses which still stood were doomed. When I revisited Guernica this afternoon most of the town was still burning and new fires had broken out. About 30 dead were laid out in a ruined hospital. “The German airmen in the service of the Spanish rebels have bombarded Guernica, burning the historic town which is held in such veneration by all Basques. They have sought to wound us in the most sensitive of our patriotic sentiments, once more making it entirely clear what Euzkadis may expect of those who do not hesitate to destroy us down to the very sanctuary which records the centuries of our liberty and our democracy. “Before this outrage all we Basques must react with violence, swearing from the bottom of our hearts to defend the principles of our people with unheard of stubbornness and heroism if the case requires it. We cannot hide the gravity of the moment; but victory can never be won by the invader if, raising our spirits to heights of strength and determination, we steel ourselves to his defeat.